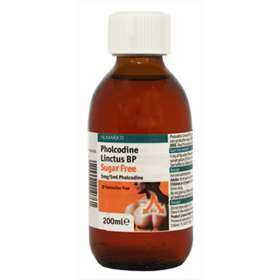 Pholcodine Linctus Sugar free B.P. is used to treat a dry non productive cough. 5mg of the active Pholcodine B.P. Also contains Sunset Yellow (E110) and Sorbitol (E420). Citric Acid Monohydrate, Saccarin Sodium, Propylene Glycol, Sodium Benzoate (E211),Carboxymethylcellulose, purified Water. Sunset Yellow (E110) may cause allergic reactions. Sorbitol (E420) If you have been told by your doctor that you have an intolerance to some sugars, contact your doctor before taking this medicinal product. Adults 10ml up to 6 times daily. Children aged 6-12 years 5ml up to 4 times daily. Not to be given for more than 5 days without the advice of a doctor. Elderly or weak patients. Give a reduced dose; your doctor or pharmacist can advise you. If you find that you need to take this medicine for a long time, or that the effect of the medicine becomes weaker, consult your doctor. If your child's condition deteriorates while taking this medicine medical attention should be sought. If you take more Pholcodine Linctus than you should: If you or someone else takes more pholcodine Linctus, you should contact your doctor or pharmacist who will recommend what action you should take. If you miss a dose, take it as soon as you remember and take the rest of the doses for that day at evenly spaced times. Ask your doctor or pharmacist for advice before taking any medicine during pregnancy, or if you are breast-feeding. Regular or prolonged use of Pholcodine linctus during pregnancy or breast-feeding may affect your baby, so follow the advice of your pharmacist.